The Cal Poly baseball team swept their first series of the 2018 season against Dartmouth last weekend. With the sweep, the Mustangs moved to 11-12 on the season while Dartmouth fell to 3-12 overall. The game was locked in a scoreless tie for the first two innings until the Mustangs broke through at the bottom of the third. An error in the outfield by the Big Green allowed sophomore right fielder Bradlee Beesley and junior shortstop Kyle Marinconz to score. Dartmouth responded by tying the game at 2-2 at the top of the fourth. The Mustangs quickly retook the lead, paving the way for an explosive fifth inning. Beesley hit his second two-run home run of the season, leading the way for a six-run inning for the Mustangs. Cal Poly then capitalized on a throwing error by Dartmouth, allowing three Mustangs to score unearned on the following plays for a 9-2 lead. Beesley produced two singles, a double and a two-run home run for his third career four-hit game. In the bottom of the seventh, junior center fielder Alex McKenna’s double brought senior outfielder Josh George home for the Mustangs’ largest lead of the game at 10-2. Dartmouth produced one run at the top of the ninth, but sophomore right-hander Connor Redmond struck out the batter swinging to seal the game. Junior right-hander Michael Clark earned his second win of the weekend as he kept the Big Green scoreless for four innings as Cal Poly continued to be locked in at the plate with an 11-2 win. Marinconz hit a two-run home run after McKenna was walked in the bottom of the first inning. Freshman third baseman Tate Samuelson’s single brought Beesley home for the 3-0 lead as the Mustangs scored three runs on three hits. The Mustangs never lost the lead, responding to a run by the Big Green in the top of the second with two runs in the bottom of the third inning for a 5-1 lead. In the bottom of the sixth inning, sophomore second baseman Dylan Doherty’s triple brought George home, and Marinconz’s sacrifice fly allowed Doherty to score for a 7-2 lead. Cal Poly pressed on in the bottom of the eighth, as three walks and an error by the Big Green allowed the Mustangs to score four runs on only one hit. The team completed a three-game sweep of Dartmouth as three freshman pitchers combined to throw a six-hit shutout in a 5-0 victory at Baggett Stadium Saturday afternoon. Starting right-hander Darren Nelson (3-2) earned the win, allowing three hits over 5 1/3 innings with five strikeouts while right-hander Taylor Dollard tossed three scoreless frames with two strikeouts and left-hander Matt Arens secured the final two outs. The Mustangs scored early and often as freshman third baseman Nick Dicarlo singled home senior designated hitter Colby Barrick to give Cal Poly a 2-0 lead after the second inning. 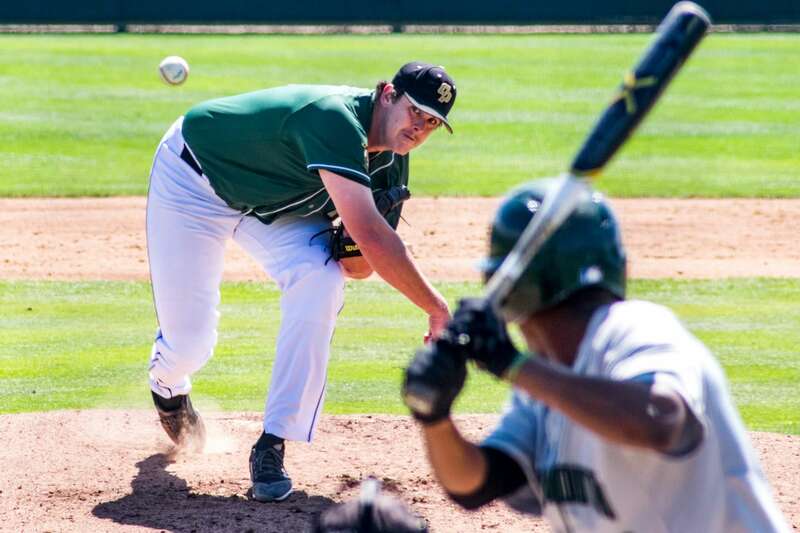 Sacrifice flies by Beesley and Doherty gave Cal Poly a 4-0 cushion after four innings. Doherty led the Mustangs with two RBIs in the final game of the series. For the series, George went 6 for 7 with two RBIs and Beesley, who had a four-hit game in Friday’s first contest, was 6 for 11 with four RBIs in the series. Next, Cal Poly will begin Big West Conference play by traveling to take on CSU Northridge in a three-game series March 29-31.